Visit our historical museum featuring exhibitions on geology, maritime history, aboriginal culture, natural history, early settlers and Phillip Island's schools, cemetery and bridges. Changing displays. Videos of the history and wildlife of Phillip Island and district are also available for viewing. The society meets monthly at the Heritage Centre Cowes, from Feb to November at 2:30pm on the second Wednesday of the month. Visitors are welcome. Thursdays: 10 am to 12 noon Saturdays: 10 am to 12 noon Tuesdays: (School holidays only): 10 am to 12 noon (Not open Christmas Day, Boxing Day, New Years Day, Good Friday and Anzac Day). Groups and schools by appointment. Adult admission by "gold coin" donation, children and students are free! 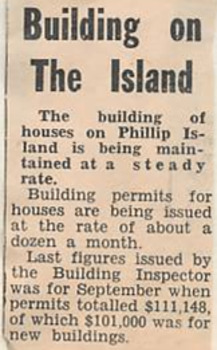 Article about the building permits for Phillip Island issued at the rate of 12 a month. Print of Phillip Island Suspension Bridge. 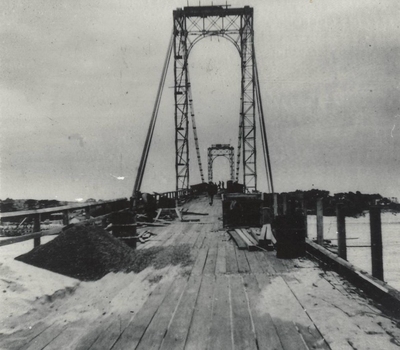 Phillip Island Suspension Bridge built 1938/40, demolished 1970. 1st road connection with mainland at San Remo. Part of an album compiled and donated by Mrs Helen Jansson. Grave Marker - Black painted clover leaf head and long straight leg. Used to mark grave at Phillip Island Cemetary. 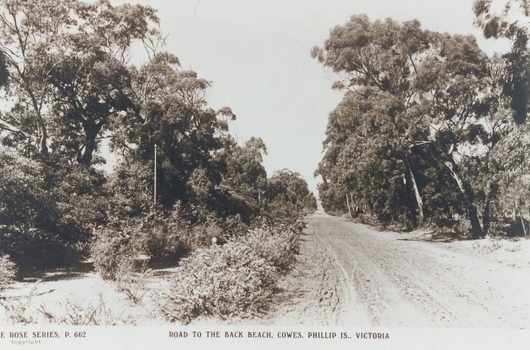 Black & White postcard of a road to the Back Beach, Cowes. "The Rose Series, P 662." 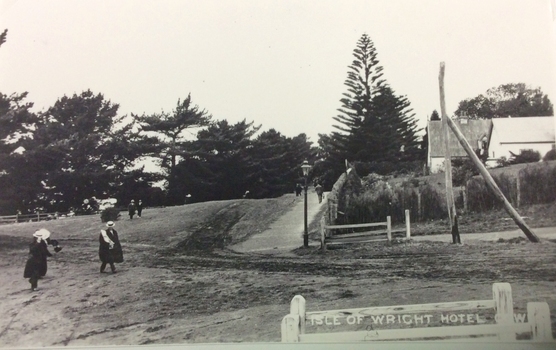 "Road to the Back Beach, Cowes, Phillip Is., Victoria"
Black & white Postcard of the Isle of Wight Hotel with Morton Bay Fig Tree in foreground. One of a collection of photographs donated by Mrs W. Rankine. 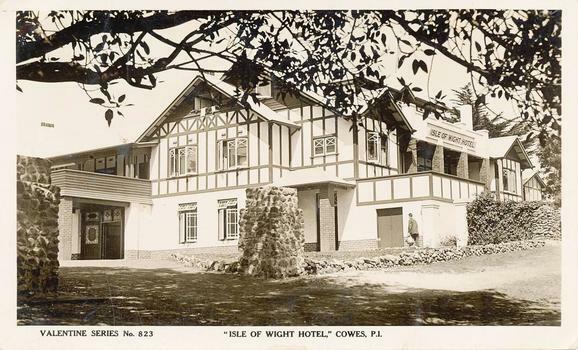 Valentine Series No 823 "Isle of Wight Hotel," Cowes, P.I. 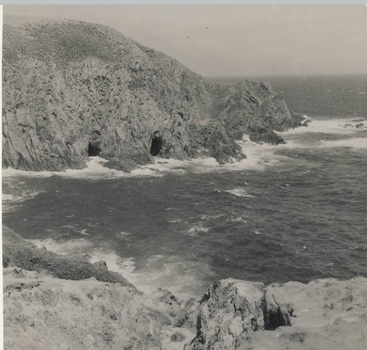 Photograph of Caves on the waterline at Cape Woolamai. The caves can only be entered by boat. Sepia Postcard - Valentine Series - Granite Quarry and Landing Place at Cape Woolamai. Labelled 'Himmer Bequest'. Stamped 'Cowes Free Public Library'. A heavy hunting and fighting boomerang with an incised design typical of the area of origin. Striped ovals design - little bird feet. 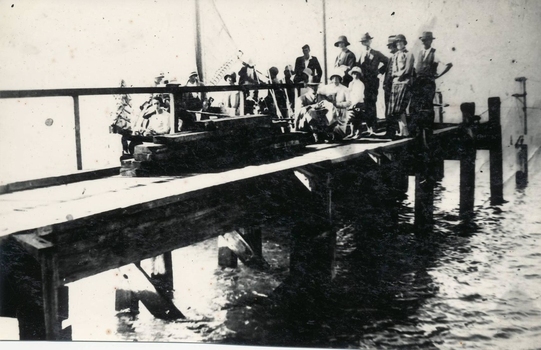 Photograph of W. J. Kennon's Jetty at Cape Woolamai taken during the Opening Ceremony. Article on RACV Caravan Rally. 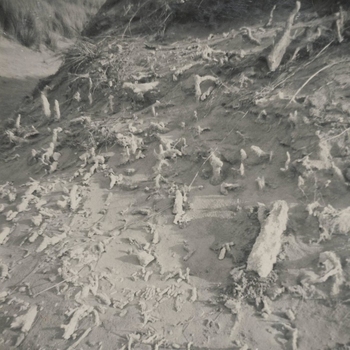 Photograph of calcareous moulds formed by early forms of vegetation and subsequent action of wind and sand. 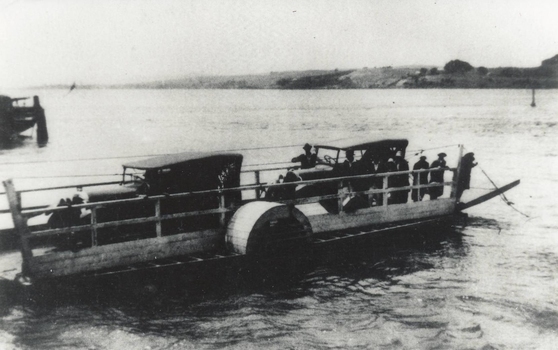 Shows the sea transport used before the Suspension Bridge was built. Punt ran between Newhaven and San Remo from 1900 - 1940. Paper cutting, Death Notices of Emma Hazeldean Jacobs (nee Anderson) 18/09/1994 at Cowes Hospital. 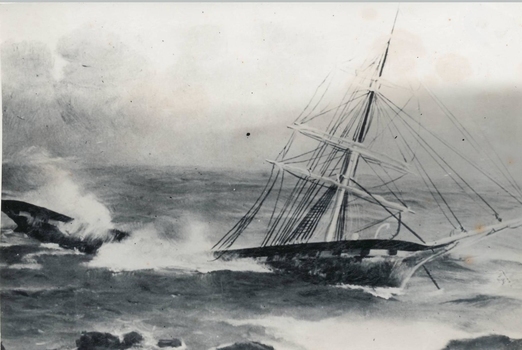 Photograph of a painting of the wreck of The "Speke" with only one mast standing. Newspaper article concerning the return of Jack Barclay (mother's name Grayden)of Hastings for Phillip Island's centenary 1968. Photograph of Barclay with Shire President and a Councillor. 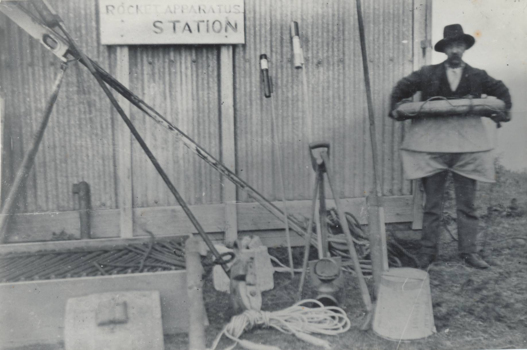 Photograph of J B Cleeland, captain of the team, at the Newhaven Rocket Shed in 1900. 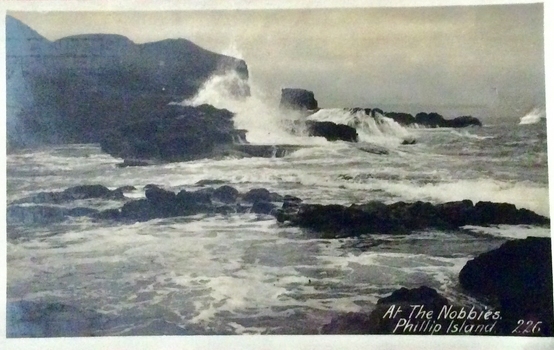 Five Postcards of Phillip Island. 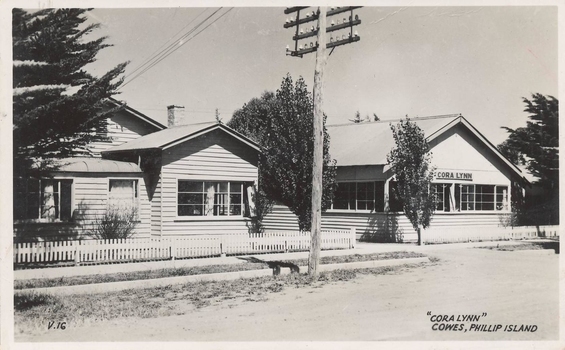 337-02 - Black & White postcard of "Cora Lynn" Guest House, Cowes. 337-03 - Coloured postcard of "Bayview" Guest House, Cowes. 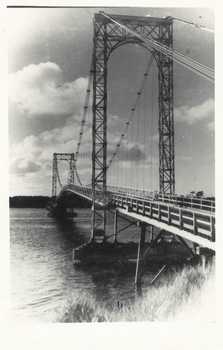 337-04 - Black & White postcard of the Phillip Island Suspension Bridge. 337-05 - Black & White postcard of the Isle of Wight Hotel, Cowes, Phillip Island. 337-06 - Black & White postcard of the Phillip Island Hotel. A collection of postcards donated by Helen Swaine. 337-02 - "Cora Lynn" Cowes, Phillip Island. 337-03 - Bayview Guest House at Cowes (Bulmer Copyright) 337-04 - Murray Views No 5. TheBridge, San Remo, Vic. 337-05 - Murray Views No. 34 "Isle of Wight Hotel" Cowes, Phillip island, Vic. 337-06 - Phillip Island Hotel, Cowes, Phillip island V19. Article on restoration of grave of Miss Eliza Coghlan at Phillip Island. She was 113 when she died and at that time was regarded as the oldest woman in Australia. 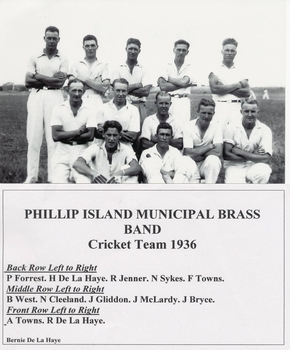 Black & White photograph of the Phillip Isand Municipal Brass Band - Cricket Team 1936. Back Row: L-R: P. Forrest, H. De La Haye, R. Jenner, N. Sykes, F. Towns. Middle Row: L-R: B. West, N. Cleeland, J. Gliddon, J. McLardy, J. Bryce. Front Row: L-R: A. Towns, R. De La Haye. One of a collection of photographs donated by Bernie De La Haye. Isle of Wight Hotel, Cowes. 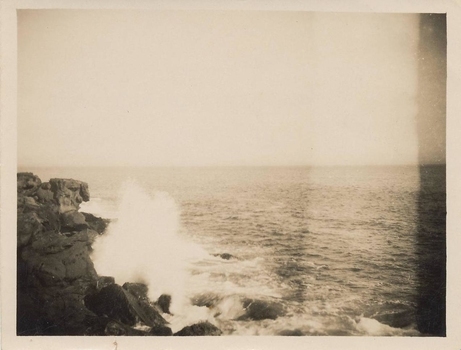 Black & white postcard of waves crashing onto rocks and stormy seas. An undated postcard from David to ? re his stay at Phillip Island, mentioning Broadwater Guesthouse and stormy weather.